Ray was born in Wallasey in 1920. His father was an architect, and both father and grandfather were keen amateur photographers. 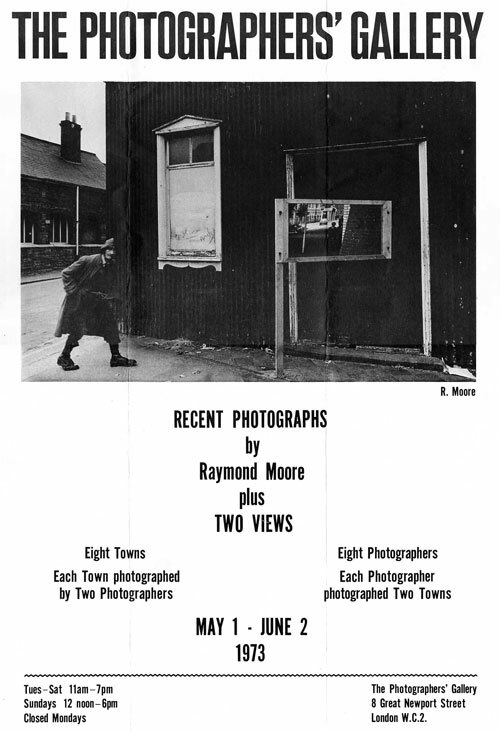 Ray started to use a camera to photograph architecture in his teens while studying at the Wallasey School of Art in 1937. Probably few of you have heard of Wallasey, but you may well know of Liverpool, thanks to the Beatles, and have heard of the Mersey Ferry. Wallasey is where that ferry takes you. In the late 70s I went with Ray and a few others – including Mary Cooper who he would shortly marry – on that ferry back to his hometown. After art school came six years in the Royal Air Force, which sent Ray to the Middle East, and he was not demobbed until 1946. In 1947 he went to the Royal School of Art in London, studying painting there for 3 years. In 1948 he met the painter with the slightly confusing name for this talk, Ray Howard-Jones, with whom he spent a number of summers painting together on the small island of Skomer, off the southwest coast of Wales. The island, about 2 miles long, is a now a wild-life sanctuary, of the most important seabird breeding sites in Europe, but until 1950 there was a single inhabited farm on it. The farmhouse was ruined in a storm in 1954. Together they painted the island and its ruins, and later, Ray Moore photographed them. After graduating, Ray got a part-time job teaching lithography at Watford School of Art. While there he became aware of the work of photographers such as Edward Weston and the Subjektive Fotografie books by Otto Steinert and began to experiment with photography as well as painting. In 1956 he was asked to start a photography course there, so found he had to learn photography. Fortunately he turned to Ansel Adam’s Basic Photo Course rather than one of the more purely technical British manuals. Almost 20 years later I too picked up a copy of ‘The Print’ and taught myself how to go beyond the basics that were all that was usually considered necessary in Britain. I’ve long regarded this series as Adams’s most important contribution to photography. In 1959, a painter friend, Malcolm Hughs organised a show of his photographs in the architecture department of the Regent Street Polytechnic in London (incidentally where the very first photography school was set up in 1841.) This was the beginning of a long friendship with Eric de Maré, (1910-2002), widely regarded as the leading British architectural photographer of the postwar period, and a leading supporter of British functionalism. Together with de Maré and Edwin Smith, another leading architectural photographer, Ray was commissioned by publisher Gordon Fraser to produce a set of postcards of historic British buildings. Ray Moore’s colour works do not particularly interest me, but they are of some historical interest, if only to remind us that photographers such as Ray (and many others) were using colour as a serious expressive medium long before the ‘New Color’ of the 1970s. His work was also featured in one of the books much of my generation learnt photography from, Eric de Maré’s paperback ‘Colour Photography’. 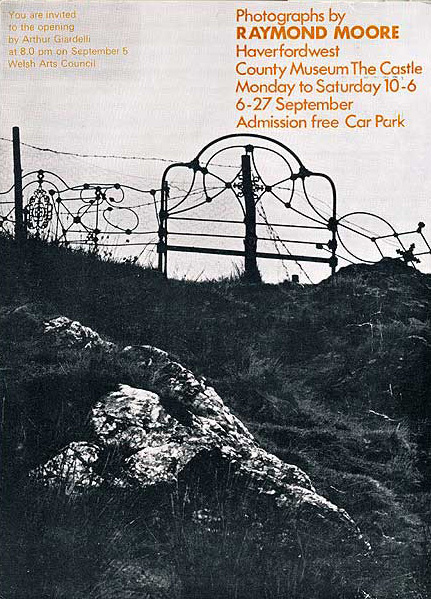 Further shows followed, including Modfot One in 1967, a touring show featuring 20 British photographers including Ray, Roger Mayne and Don McCullin as well as students from six colleges. This toured around Britain and in Europe, and Bill Jay edited a small publication on it as a special supplement to Camera Owner, the magazine that was to become Creative Camera. The poster for Ray Moore’s touring show with the Welsh Arts Council in 1969. 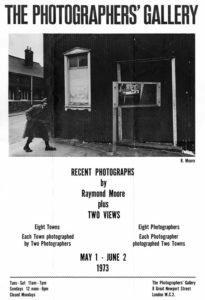 In 1968, Ray got official recognition, when the Welsh Arts Council in Cardiff put together a touring show of his work, the first exhibition by a British Arts Council devoted to a single living photographer. The catalogue for the show was also the first publication devoted to his photographs. The same year, Creative Camera published a portfolio of his work, with a further 2 pictures from the show the following year. Murmurs at every turn ‘Remember me’. 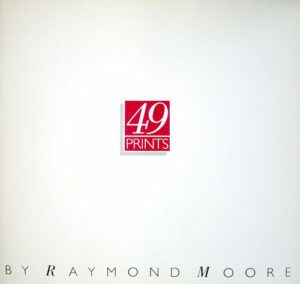 The Photographers’ Gallery in London showed Ray’s work in 1973. Creative Camera published more of his work in 1972 and 1973, and a ‘Retrospective’ of 24 full-page pictures was the lead portfolio in the ‘Creative Camera International Year Book 1977′ published in 1976. By 1974, he was teaching at Trent Polytechnic in Nottingham, part of a Trent/Derby photography partnership lead by Paul Hill. In 1976, Paul set up a series of photography workshops at his country cottage which he renamed ‘The Photographers’ Place. I read an account of a workshop there given by Paul Caponigro, decided it sounded interesting and booked the next available course I could attend. This was a workshop led by Paul Hill and Ray Moore. There I found that Ray was not just a fine photographer, but also something perhaps even more rare, an inspirational teacher. That was the first of several workshops with him I attended, which set me more firmly on the road as a photographer. Since then I’ve attended a number of other workshops, but never one with a similar impact on me to Ray. Ray’s whole approach to teaching was to look through the work to the person, and to teach the person to know and be themselves, and then to respond to the subject. In 1978, Ray gave up teaching and devoted himself to photography, living on the Cumbria coast together with his young wife Mary Cooper. The following year I met him again at the opening of the show ‘Three Perspectives on Photography’ at the Hayward Gallery in London. It was a rather dispiriting event looking at different current approaches – feminist, community photography and fine art, and mixing a little good photography (some in all areas) with overmuch polemic. 1981 was a better year, when Ray became the first photographer to have a major retrospective organised by the British Arts Council, again at their flagship Hayward Gallery. Together with Travelling Light, the publishing company run by former Creative Camera editor Peter Turner, they produced a publication of his work, ‘Murmurs at Every Turn’. Bill Brandt had been given a retrospective at the Hayward in 1970, but that was organised by the New York Museum of Modern Art. Two years later, a further book, ‘Every So Often’ appeared, with his pictures from the late 1970s and early 1980s along the coast of Cumbria and a few in the south west of Scotland (he and Mary had by then moved to Canonbie in Dumfrieshire, just north of the Scottish border.) The was brought out by BBC North East and the North East Arts Council, together with a film of the same name. The cover of the slim catalogue for the ’49 Prints’ show. In 1986, the British Council and the Birkstead Gallery in London organised the show called ‘49 Prints’, of which seven are in the catalogue. Following his death from heart failure in 1987, there was a memorial tribute in Creative Camera, and an exhibition of his work at the Houston Fotofest of 1990. There is one picture and a short perhaps rather grudging note on him in Aperture 113 ‘British Photography: Towards a Bigger Picture’ (1988) by Mark Haworth Booth “His work developed into an intricate, understated art that seems particularly English in its simultaneous exploration of the photographic gray scale and the nuances of a predominantly northern (gray) climate, producing images that are at once down to earth, steeped in melancholy. 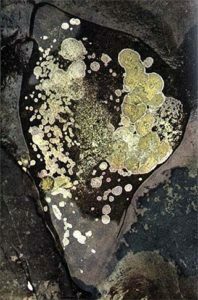 And broken with serendipitous illuminations.” His work was also included in the 1989 show ‘Through the Looking Glass: Photographic Art in Britain 1945-89′ in London’s Barbican Gallery. Since then, relatively little has been heard or seen of his work. The British photographic establishment seemed by the time of his death to regard him as an unfortunate and rather embarrassing episode that was best brushed under the carpet. Many photographers who knew him or have come across his work in the few slim volumes, myself included, still regard him as a major figure in photography.